We’ve thrown many a client event at Small Girls PR, from prom fashion shows to thought-provoking brunches, drawing party app launches to pop-up shops. As we go full swing into the madness of holiday party season, the same elements that make a party year-round are important to keep in mind when planning a memorable holiday party. And, because the fashion industry loves its yuletide celebrations, it’s extra important to put that something special in your party planning. 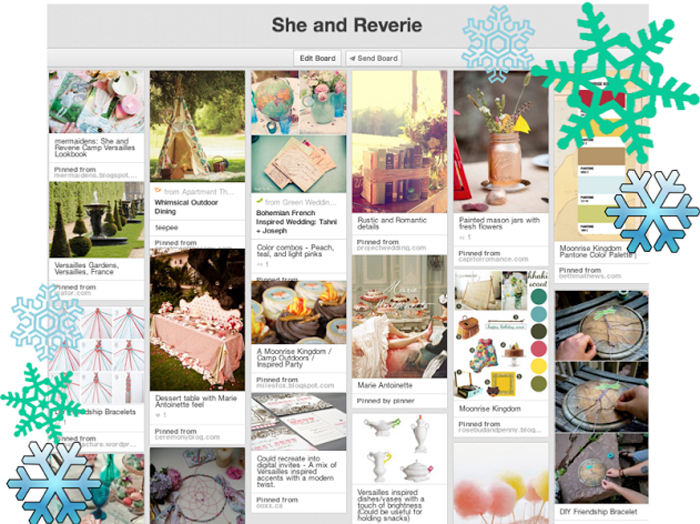 Below are some Small Girls PR examples and tips for throwing a great holiday event. Everyone sort of expects the same glimmery, winterscape or red&green/blue&silver decor at holiday parties. Santa hats, dreidls, and snowflakes abound. Why not make it a little less predictable by tacking another theme on it? Our friends at Days app and ScrollKit are throwing a Friday the 13th Formal Holiday party, and asking guests to dress as fancy vampires. Have a ‘Dreaming of a Neon Christmas’ and deck the halls with brights instead of white- complete the fun with glowsticks and glow-in-the-dark face paint. Forego the ugly sweater party and instead don ugly holiday pants. Your guests will feel like they opened a present and got an unexpected surprise. This is an excellent way to start a party! What you’ll need: Use Pinterest to create a mood board for your event and save everything that inspires you as you pull together your off-kilter theme. Whether its a musical guest, acrobats or a 4th grade choir, offer entertainment through talent that is a fit for the brand personality and event theme. 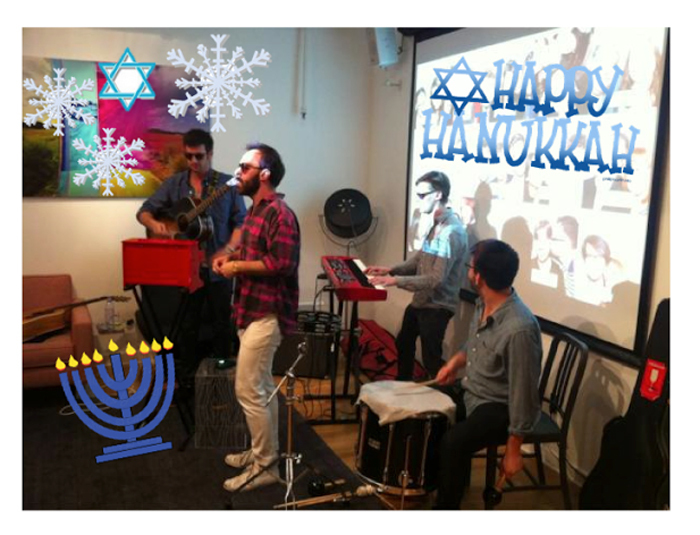 For example, our client, Meetup hired a bluegrass band from a popular meetup group in their community for their 100th millionth RSVP party, and eyewear brand Tortoise & Blonde often incorporates the artists and dj’s they sponsor to perform at their events. What you’ll need: Going to social media to find great talent is actually an easy way to go. Check out what independent bands your employees, friends or fans are into on Spotify or soundcloud and shoot them a message via twitter. Maybe some of your fans are actually amazing performance artists or tarot card readers. For any big name artists- their reps are usually listed on bios or on their Facebook pages with contact information. There’s nothing worse than a party where everyone is just standing around, drink in hand. Instead, create a fun activity to bring your guests together. When you create a few activity stations you give guests something fun to take home and an easy place for strangers to break the ice and get to know one another. 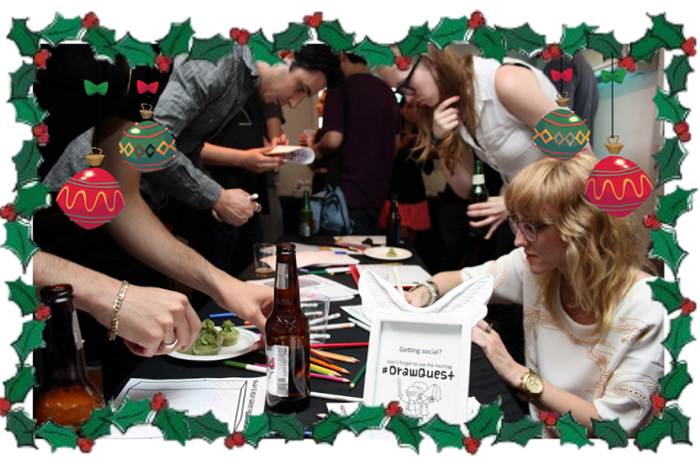 We had a drawing station for creativity app Drawquest, that was hugely successful – and entertaining! The trick is to choose activities or DIY stations that are tied to your brand (or your client’s), by choosing things to decorate or create with that are in the company’s aesthetic or color scheme. For example, a Small Girls holiday ornament station would probably have studs and holiday colored bows to match our mix of girl and grit (and website design). What you’ll need: For holiday, have a greeting card station at your party, or invite guests to write letters to Santa. Consider an ornament or mini-wreath-making station. Consider things that guests can work on individually but that when put together create something bigger – like a mural or a huge lego santa! In our world, if you throw a party, and no one tweets about it, did it even really happen? This is something we often joke about in the industry, but there’s actually some truth to the statement. Why just share the fun with people currently in the rooms when you can share it with the ‘world.’ It’s not that every single company holiday party is an opportunity for PR and attention, but rather than including fun elements that people can share with their networks keeps guests entertained, gives them something tangible (or digital) to remember the event, and can raise the profile of your client if you come up with a really great shareable moment. What you’ll need: Everyone loves a good photobooth! 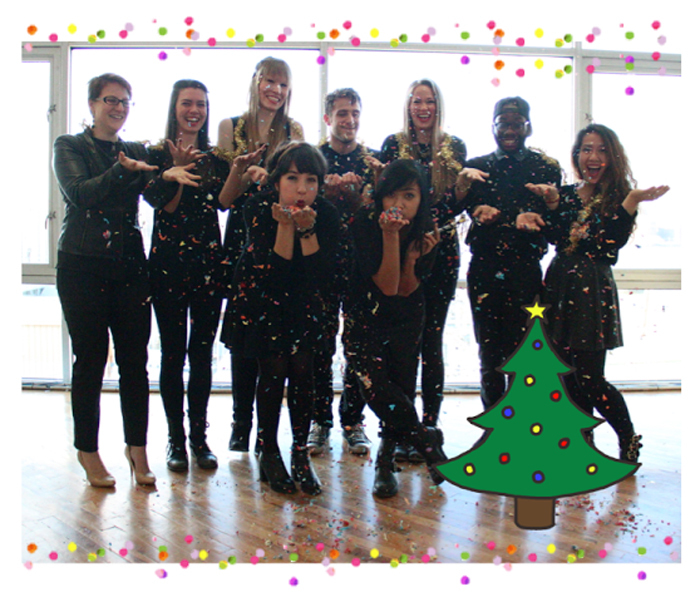 For a holiday party, think of it like an easy way to get your holiday cards sent out – except way more fun. Whether you go with Bosco Booth, Nicky Digital, or a different company, you’ll want a photo booth that has integrated social sharing capabilities which will allow you to bring the party from IRL to URL. 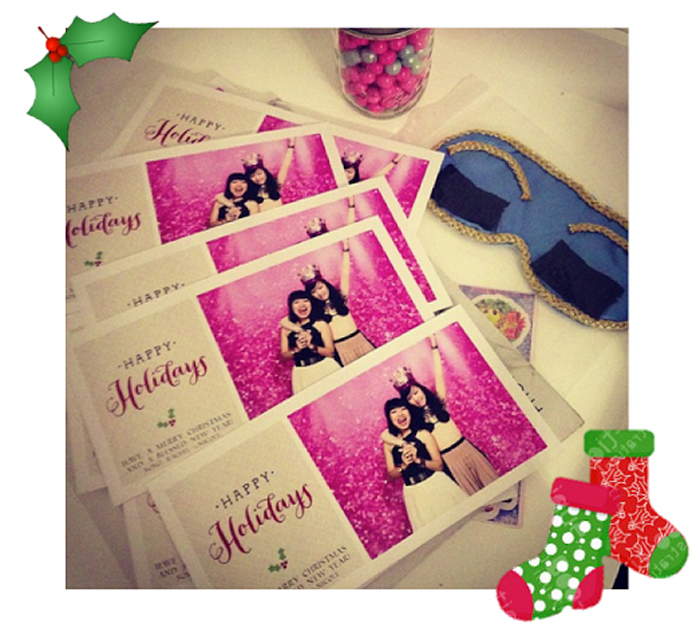 These types of companies provide physical as well as digital prints, so you can take those physical photos the day after the party and send them to your favorite people with a fun holiday message. Take a page from bloggers Rachel et Nicole with their pink glittery photos from our PromGirl fashion show in 2012- and get mass prints made after the event and send out to friends, colleagues, and fans. Use props, or create them yourself to really bring a more homey sense to the brand, as we did for our Hinge NYC app launch. Having an open bar is like the longstanding host tradition of having guests to your home and offering them a drink. Whenever possible, spring for the drinks. If the bar is hosted for only a portion of the evening, or cash only, be extra clear about these limitations on your invites. What you’ll need: A signature drink with a festive name – we love the idea of creating a “Red Nosed Reindeer.” And don’t forget something for those who aren’t drinking, like a special hot chocolate or cider with a twist. Handsome Dan’s created a pink hot chocolate for our PromGirl Fashion Show that was a big hit and the perfect fit for the teen dream wonderland we developed. And speaking of Handsome Dan’s- never underestimate the power of candy to get a nice happy crowd full of sugar! 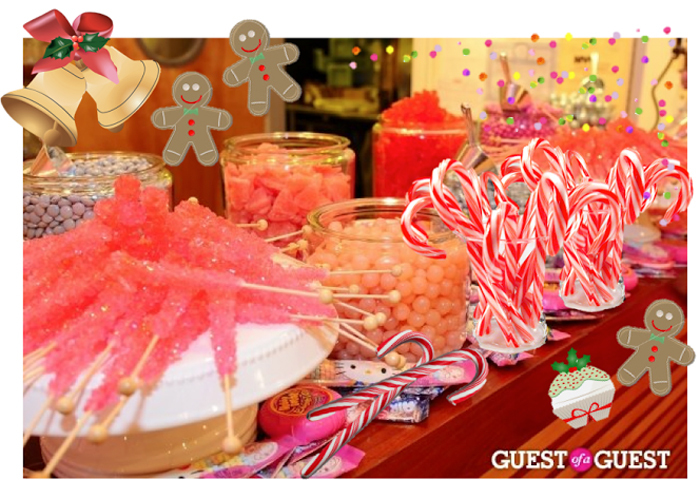 We often use the Williamsburg-based candy shop to add a sweet touch that fits the theme of the events we throw. No matter what it is you’re trying to celebrate- it makes no difference with a party of one. 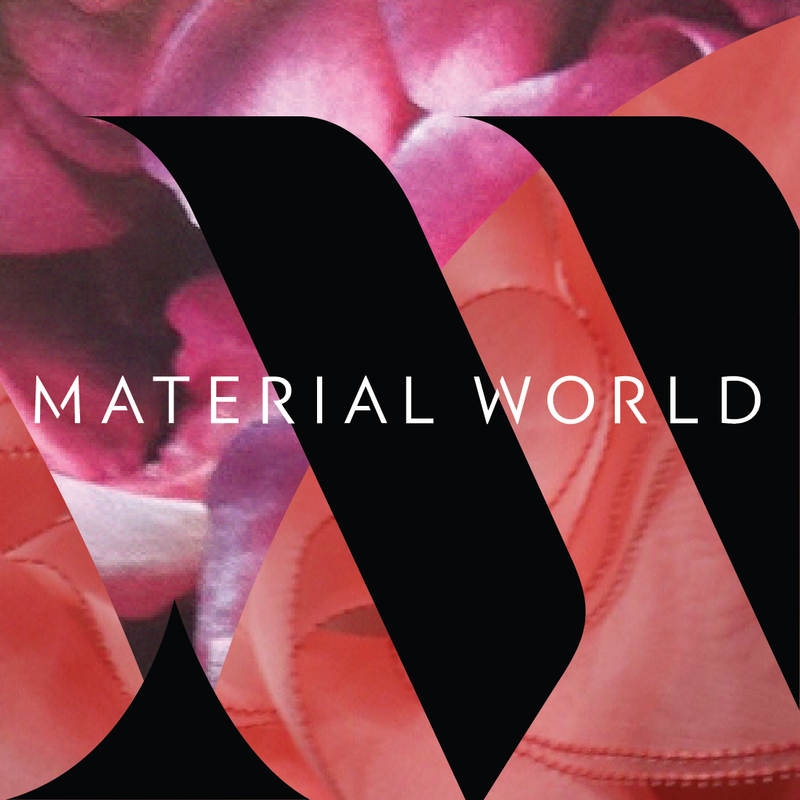 Generally, the goals of a client event dictate who to include on the invite list – for example, a media launch will be filled with press, but a shoppable pop-up store will be more consumer-friendly. When it comes to holiday parties, it’s a time to bring together friends and perhaps those considered ‘family’ to your client, whether that be investors, other companies, and close supporters. Invite people that you’d like to thank for bringing a wonderful year, editors that covered your brand in the past, and of course any media or influencers that you’ve partied with in the past. Of course, you could also do a much smaller, intimate event and keep it really close to the ‘fam.’ In that case you might host an employee-only event (and their respective +1’s) to thank them for their hard work through the year. 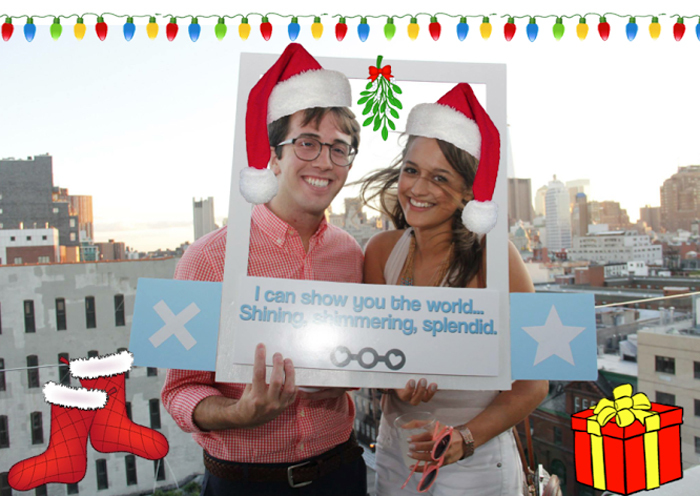 What you’ll need: Use Splashthat for your holiday invite. It’s super customizable and you can use the same URL as a landing page for photos and social shares that you guests can check later. This one comes from the small girls mantra that glitter makes everything better, and of course there’s nothing like sparkles to make everyone feel a little bit festive. #duh. Small Girls PR co-founder Bianca Caampued heads creative campaign strategy, blogger/influencer collaborations, and event production for Small Girls’ brands. She has worked with fashion, beauty and retail accounts- from licensed brands, to e-comm and independent designers- during her time served in advertising & promotions at Lucky Magazine. 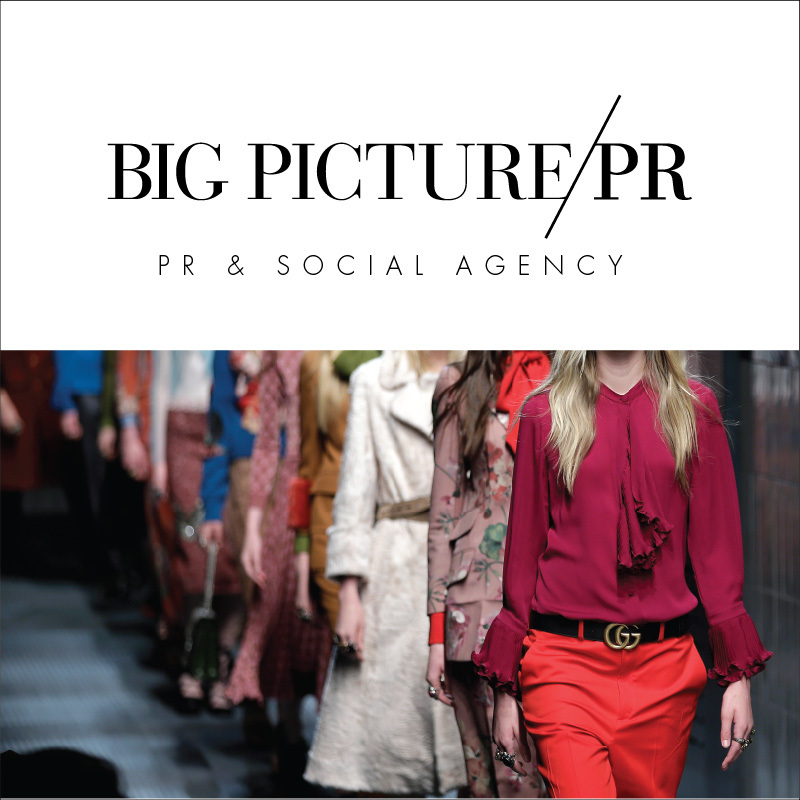 Believing social media and compelling brand content are an integral part of any PR campaign, Bianca ideates unconventional ways to promote Small Girls clients- including Simon & Schuster titles, eyewear brand Tortoise & Blonde, and prom dress clients Tiza.com and PromGirl. A natural connector, she loves bringing people and brands together both socially and professionally. Bianca works closely with style bloggers as friend and client liason. Connect @smallgirlspr and @biancarocksout.